The information that we are sharing from the lecture entitled, “The Power of Prayer,” is really a teaching on the Power of Thought dealing with the science of electricity transmission (sending and receiving). It is intended truly for those who disbelieve in the Power of Prayer as it is written—two will be walking; one will be taken and one will be left. Two will be at the mill, one will be taken; one will be left. Two will be in the bed; one will be taken and one will be left. The Honorable Elijah Muhammad gave us the science behind every law of the universe. That is what we are getting to right now. There is no “spookism” in Islam. God is Real. You are real. We are real and we move by the scientific laws of our mechanical Universe that was put into motion trillions and trillions of years ago. The Honorable Elijah Muhammad told us that you will hear a ring, a bell-like sound, in your ear. He said, that that will be a sign that either he would be trying to get in contact with you or one of the scientists that will be trying to get in touch with you. He further stated that two of us will be walking together, doing normal things, in the mall shopping and he said that that message will come through the ear, through the power of hearing. One will hear it and the other will not; and in that time, the message will be the communication of thought coming from these high-born scientists and you will have to follow the instructions of what that voice is telling you to do. Now, the question is: Have we cleaned up this vehicle to be able to hear those high frequencies of sound? These high frequencies of sound are emitted from a light, a form of electricity. The use of electricity is one of the great mysteries that Master Fard Muhammad shared with the Honorable Elijah Muhammad upon His departure which still at that time remained a mystery. These electronic impulses that permeate our atmosphere are connected to our orbits in space, such as the sun. As the sun is the center of our galaxy and its energy or light waves are able to strike nine planets full of life that are rotating on this sphere, we become more conscious that we are part and parcel of every element of matter; every element that makes up the atomic weights and energy fields and its chemical composition. Should we not purify this vessel so that when we pray, which is our subject, we are cognizant of the natural, physical, biological and electronically charged atomic law? How much more powerful will our prayers be if we become more conscious? We are more conscious when that energy, like a crystal, amplifies our thoughts. They have an effect on the cells of our bodies. They have an effect upon the blood coursing through our veins. Light and blood travel at the same speed. The blood circulating through our body takes about eight minutes, and it takes light approximately eight minutes from the sun to strike the earth. We are the inhabitants of the earth and we are connected to the cosmos. We are connected to every element in the universe. Recently, I was invited to Cleveland, Ohio, and that is when the triggering of some higher frequencies began to manifest themselves and we observed during those sessions on a Saturday afternoon, leading into Sunday, how we could perform a group collective prayer for the Honorable Minister Louis Farrakhan that would be on one and the same frequency; and that one and the same frequency to be prayed simultaneously at the same hour. We chose the Fajr, or the Dawn Prayer. 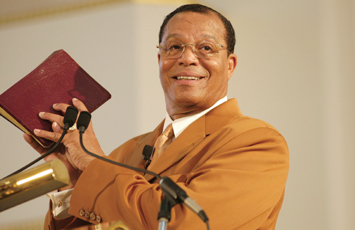 When conducting our Morning Prayer, we should visualize the light that the Honorable Minister Louis Farrakhan saw in September of the year 2001, which appeared like a crystal diamond in the sky. There were other witnesses of this sighting. I don’t know if you are aware of this experience that has taken place since his vision of 1985. It took place, once again in the Mexican Village of Tepoztlán at midday, around 1:30 in the afternoon. This enormous, bright light appeared brighter than the sun. Not only did it light up the sky, but remained stationary for several minutes, making a pulsating movement going up and down, and sideways while two objects came out of it simultaneously. One went to the right and the other to the left. Then suddenly this bright light appeared to be communicating with the Minister. 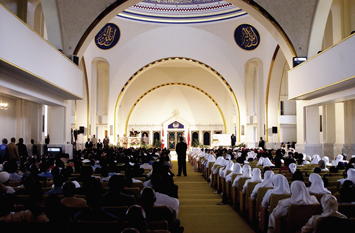 As it began to pulsate, we observed a tear falling from one of the eyes of the Honorable Minister Farrakhan. It was a sign to him, perhaps, of the future preparation to see the Honorable Elijah Muhammad face to face. Being unaware of the future struggle that he would have to overcome in his physical pain and agony and hospitalization and surgery to be ultimately renewed throughout all the cells of his body through the sign of this powerful light, as we visualize this light on the outside, bring this light inside and begin to reflect the divine light of Almighty God Allah. As we prepare this vehicle, this light, eating properly, thinking properly, behaving properly, being in an upright state, to begin our prayer.